As with basketry, American Indian pottery traditions are difficult to generalize about because they developed so differently in different tribes. When it comes down to it, everybody needs someplace to store their corn. Just about every culture that does any farming at all developed pottery in ancient times, and American Indians are no exception. Southwestern Indian pottery is probably the most famous, for its colorful designs and figures, distinctive forms like the double-spouted wedding vase, and unique techniques like the Pueblo "black on black" firing. The Southwest tribes are unquestionably the ones who have preserved their ceramics heritage the best--and, not coincidentally, the ones who still live nearest to their original homelands. Elsewhere in North America, Indians were forcibly transplanted to reservations where their traditional agriculture was not viable; less malignantly, some tribes, like the Sioux and Cheyenne, abandoned their farming practices and adopted a more nomadic lifestyle when they acquired horses from the Europeans and were able to pursue the buffalo herds. However, before European arrival, native pottery was made throughout most of the continent: by the Cherokee and other Southeastern Indians, the Iroquois and other Eastern Woodland Indians, the Cheyenne and other Plains Indians, and the Shoshoni and other Great Basin Indians. (Further to the north, most of the people were hunter-gatherers, for whom pottery is less useful and more of a liability.) Some artists from these non-Southwestern tribes have recently begun to reclaim their ceramic traditions. Though Native American pottery styles, firing and finishing methods, and decorative patterns varied widely, the basic technology did not--as far as I know no tribe ever used pottery wheels or other spinning instruments. All of them made coil and pinch pots by hand, as their descendants still do today. If you are looking to buy pottery or ceramics that were actually made by Native Americans--either because it's important to you to have the real thing or because you want to support native people with your purchase--then here is our list of American Indian artists whose pottery is available online. If you have a website of Indian pottery to add to this list, let us know. We gladly advertise any individual native artist or native-owned art store here free of charge, provided that all pottery was made by tribally recognized American Indian, Inuit, or First Nations artists. On our main site we do our best to avoid slowing down our page loading with graphics, but this page is about art, so we'd really be remiss in not showing a few representative pottery pictures. All photos are the property of their respective artists; please visit their sites to see their work in more depth. An Indian-owned gallery of fine Pueblo Indian pottery by award-winning San Ildefonso and Santa Clara artists. Tewa Indian art gallery of Pueblo pottery and figurines. Navajo wedding vases and other horsehair pottery from a Navajo-owned crafts store. 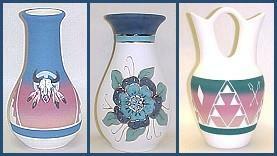 Contemporary American Indian pottery handpainted by a team of Lakota artists. 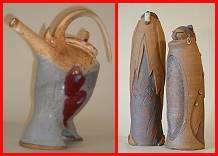 Contemporary ceramic figurines and pots by a Navajo artist. Beautiful photographic collection of contemporary Native American pots from many different tribes. Attractive beginner's overview of Southwest Indian pottery, with photographs and advice for collectors. History, interviews, and photographs on the art of Pueblo pottery. History and photographs of ancient Hopi Indian pottery and symbols. Native Tech Pottery and Clay: Articles on Indian pottery making in various tribes, with diagrams. Native American Pottery and Sculpture: History, reviews, and photographs of native pottery traditions in different tribes. Southwestern Native American Pottery: A beautiful collection of Indian pottery photographs. Mohawk Pottery: Pictures of a contemporary Mohawk Indian pot. Native American Arts and Crafts: Orrin contributed to this larger directory of Indian crafts, many of which are authentic. About us: This website belongs to Native Languages of the Americas, a non-profit organization dedicated to preserving and promoting endangered Native American languages. We are not artists ourselves, so if you are interested in buying some of the pots featured on this page, please contact the artists directly. Though we have featured only Native American pottery identified with the name and tribal affiliation of each artist, we haven't called the tribal offices to check up on any of them, and we only know a few of them personally. We also don't guarantee any of their products. This is not an exhaustive list of American Indian pottery--if you would like us to add your pots to this page, please contact us with your URL and tribal affiliation. We advertise any individual native artist or native-owned art business here free of charge. We do not link to pottery which is not made by tribally recognized American Indian, Inuit, or First Nations artists, so please do not ask us to. And finally, websites do occasionally expire and change hands, so use your common sense and this general rule of thumb: if the creator of each individual artwork is not identified by name and specific tribe, you are probably not looking at an authentic American Indian pot.